MAJESTY "PLUM" VELVET WITH GODIVA "LILAC" PATTERN, SELF-BUTTONS, SMALL CRYSTAL TACKS, AND SILVER LEGS. Remember when the drive-in movie was also known as the “passion-pit?” You don’t have to sneak away to the drive-in to neck any longer. 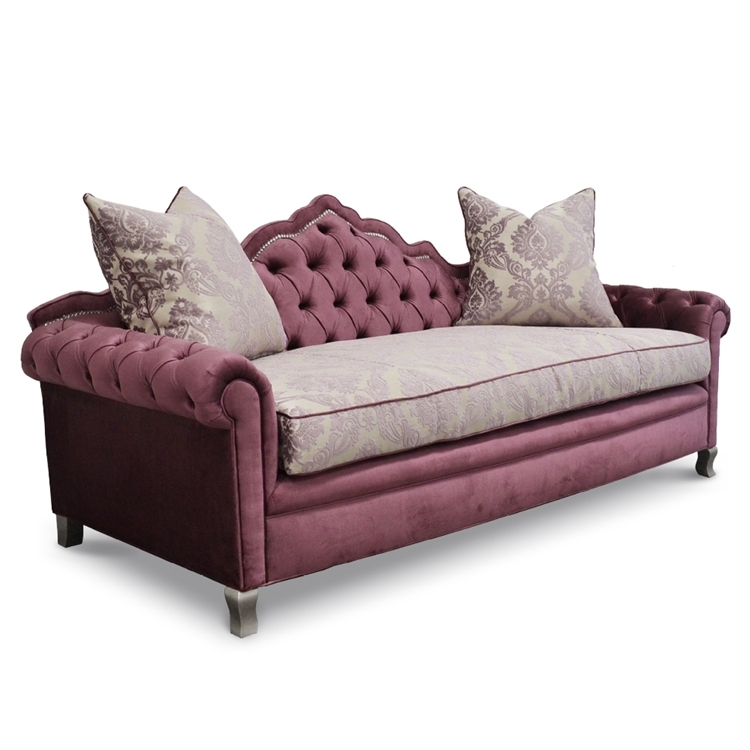 This Amour Sofa’s beautifully sculpted silhouette, rolled and tufted arms, and sparkling accents provide an adequate haven for sophisticated smooching. Item not available as shown online, Godiva "Lilac" pattern is discontinued. Please contact us for other pattern choices. Sofa comes with foam filled seat cushion and (2) accent pillows. Boxed weight is approximately 278 lbs. Contact us at info@hautehousehome.com or 323.256.2800 for custom options.